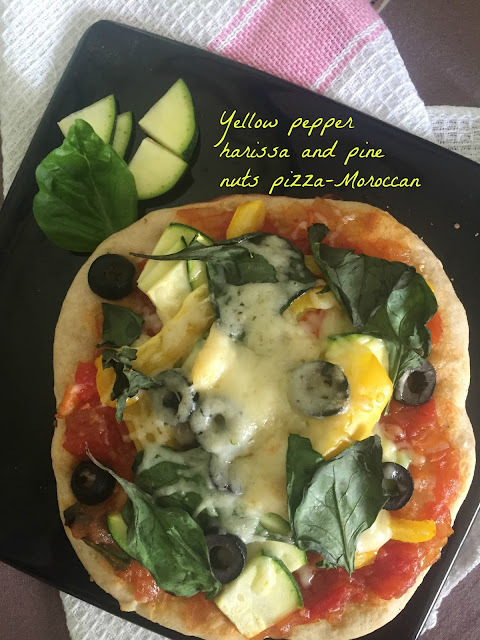 The most popular vegetables I found in moroccan cusine were zucchini, aubergines, olives and peppers, yellow pepper pizza is actually the Yellow version of the Pepper pizza I tried a few weeks back at middles eastern and african fare. I had the chance to talk to the chef so I learnt from her (not him for a change!) 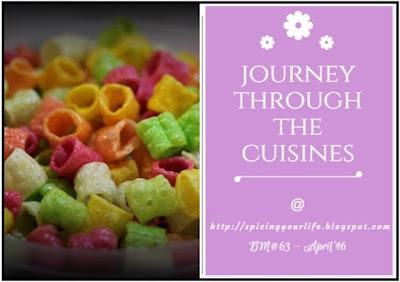 that she had used harissa paste as the sauce- I love spicy sauces and when it comes unexpectedly it blows me off, so when I was expecting to bite into tomato kind of sweet and sour sauce, I got hit by a gush of hot air only to be cut down by the sweet bell peppers roasted beautifully. Everything about this pizza is amazing....or the one that I tasted. In my version I did add a couple of blobs of tomato sauce to tone down the spices but that one was the family version which you will see in the picture...I made mine - not so nice looking so skipped capturing it. 3) Grate the cheese and sprinke liberally with pine nuts. 4) Season with salt and pepper and pour some olive oil. Harissa as a sauce for the pizza sounds wonderful. This pizza does look amazing though you made some minor changes. Yum! Omg, this is definitely an exotic pizza, love all the ingredients went in it. Wish i get a slice Pradnya. That looks different than the regular versions we come across. And the sauces add a new flavor layer. Looks like a wonderful pizza to dig in! That is a nice combination of veggies and nuts in the topping. Harissa for spread sounds so spicy.. Interesting pizza . Harrisa tastes super and this pizza is making me hungry. Very interesting pizza with Harissa.Love to try it. Interesting sauce for the pizza. Moroccan pizza with harissa is such an interesting twist to regular pizza. Loved the idea!